In January 1901, nine Czech Americans met at the local General Store in the small farming community of Ocker, Texas. They emerged from that meeting with a plan to protect each other from the financial disaster that could result if a fire or storm damaged their property. Their vision was about neighbors helping neighbors with the availability of affordable insurance. They realized that they could pool their resources to provide themselves with mutual assistance. On February 22, 1901, they formed Rolnický Vzájemně Ochranný Spolek Statu Texas (RVOS), a non-profit farm mutual insurance association, and their vision of neighbors helping neighbors was born. Farmers Mutual Protective Association of Texas, as RVOS became commonly known, is the American translation of the original Czech name. The plan of the nine founding members was to pay a prorated share of losses suffered by other members of the association, up to $3 each, for every covered claim filed. By the end of 1901, their membership had grown from the original nine members with a $12,816 of total insurance coverage to 416 members with $217,512 of coverage. 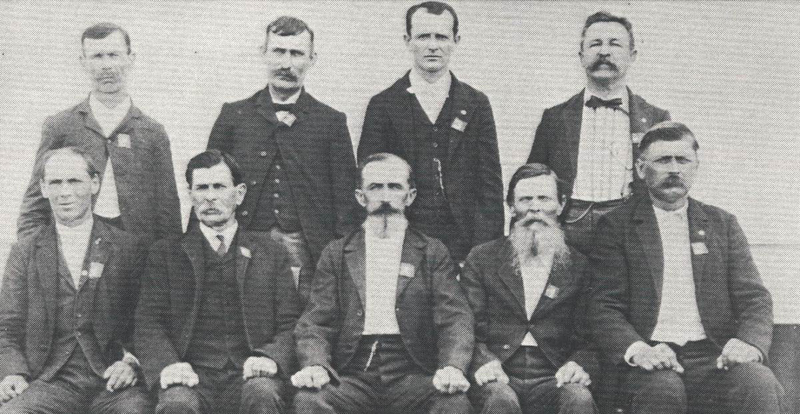 In June 1901, the Articles of Incorporation were completed, and a special meeting was held to adopt the Association’s bylaws and elect its officers. To this day, the RVOS membership is comprised of each person whose property is accepted and insured through the Association. In February 1902, local lodges were formed to represent these members in their respective communities. These lodges continue to be an integral part of the RVOS family. Local lodges elect their own officers out of their membership, including a President, Secretary, Treasurer, and Convention Delegate(s). RVOS lodges are active in their communities. They can provide scholarships for local teens and participate in area fundraisers, as well as donate to food banks, Habitat for Humanity, and local volunteer fire and emergency service departments. Every member is invited to attend the regular local lodge meetings and is encouraged to be an active participant. Because RVOS is ultimately run by its members, a General Convention is held every four years to conduct the business of the Association. The location of the convention varies and is usually held at a central location in the state. The membership of each local lodge elects its own delegate(s) – one delegate for every 200 lodge members. Any member is free to attend the General Convention, but only the elected delegates can vote. Since a Home Office location did not exist for the first 45 years in the Association, its affairs were primarily handled out of the homes of the Secretary and Treasurer, who each resided in different parts of the state. The 1946 General Convention authorized the creation of a home office while requiring both the Secretary and Treasurer to reside nearby. For the first time, daily operations were handled out of the same office. In 1951 RVOS purchased its first home office building at 20 South 4th Street in Temple, Texas. This building was RVOS’ home for the next 30 years until the current building was built in 1981. RVOS Home Office employees have enjoyed our new home at 2301 South 37th Street in Temple ever since. When chartered by the state of Texas as a farm mutual, RVOS was allowed to write property insurance coverage only – the Association could not write liability insurance coverage. In 1979, the Association formed a wholly owned subsidiary called Texas RVOS Insurance Company in order to provide liability coverage for its members. In 2000, the Texas RVOS Insurance Company name was changed to Priority One Insurance Company and continues to this day with that name. Priority One is a stock company regulated by the Texas Department of Insurance and all stock is owned by RVOS Insurance. It offers many different coverage options. Currently, Priority One customers may purchase Texas Dwelling and Homeowner’s policies, in addition to Comprehensive Personal Liability and Farm Liability policies under the Personal Lines options. Commercial Property and Commercial General Liability policies are also available. In 2008, the Association incorporated New Century Insurance Company. Also a wholly owned subsidiary of RVOS, New Century Insurance is a chartered property and casualty insurance company. In an ongoing effort to provide more types of coverage requested by its membership, RVOS formed RVOS General Agency, Inc., in early 1999. It was organized as a managing general agency (MGA), with Priority One Insurance Company as its only stockholder. The MGA is a competitive resource for anyone in the market for automobile, flood, life, mobile and motor home, watercraft, and ATV coverage. From almost the time of RVOS’ inception, the Association has published the Rolnik quarterly magazine, otherwise known as Texas Farmer. This publication is full of useful information for all members, and it’s an excellent resource for keeping up with local lodge activities. Though the little town of Ocker, Texas, slowly declined and eventually disappeared, RVOS and its subsidiaries have continued to thrive for well over a century. On October 20, 1987, a Texas Historical Marker commemorating the founding of the Farmers Mutual Protective Association of Texas (RVOS) was dedicated. The dedication took place at the marker site located at the intersection of FM 2904 and Highway 320 in East Bell County, which is not far from the current home office location in Temple, Texas. From our humble beginning at the start of the 20th century, we have never wavered from our motto of “Neighbors Helping Neighbors,” and we sincerely hope you’ll join our family of companies and become a part of our neighborhood. Front Row L-R: Jos Wentrček, F.V. Schiller, Jan Baletka, Joe Schiller, Jan Zabčík. Back Row L-R: J.R. Marek, Martin Stěpan, J.R. Schiller, F.J. Wotipka.